← Help! I’ve Been Muggled! Don’t you love when you find a dish that is a surprise? I would have never thought to grill Romaine lettuce however I was served this as the prelude to a delicious meal at the Venice Café and immediately had to figure out a way to duplicate it. 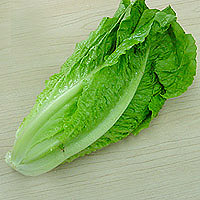 Romaine lettuce is a staple in our house. So is Balsamic vinegar. So this is a dish that can be whipped up at any time. Of course it helps to have the predictably wonderful Gulf coast weather in Florida which allows us to barbecue almost every day. This is a delicious sweet-tart dish. A bit of feta cheese sprinkled on top completes your deceiving simple gourmet dish. 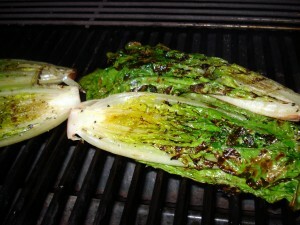 Plan on ½ heart of Romaine lettuce and ½ cup Balsamic vinegar per person. This recipe is for 4 people but it is easy to fix the dish for more. 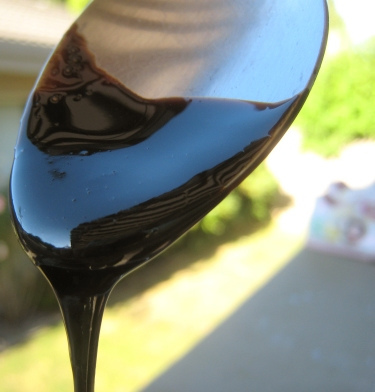 Pour vinegar and sugar in a pan and cook on the highest temperature. Whisk it constantly so it doesn’t burn. The reduction is finished when it is about half the amount you started with and syrupy. Place pan on lowest temperature and whisk occasionally. Slice the Romaine lettuce hearts in half length-wise. Brush olive oil on the sliced sides. Place hearts on the grill. The lettuce will wilt. Cook until the bottom is slightly brown. Transfer each half heart to a salad plate and dribble warm Balsamic vinegar reduction over them. Sprinkle a bit of feta cheese and grind some Himalayan salt and pepper over your masterpiece and serve immediately. This entry was posted in Accommodations and Restaurants, Bob Wilson Photos, Recipes and tagged balsamic vinegar, balsamic vinegar reduction, easy recipe, grilled romaine lettuce, Venice Cafe. Bookmark the permalink. Shawn, what a unique idea. I think I will have to try this. Thank you Shawn for thinking of sharing this with all of us. Would love to be in Venice too but this is second best. Very considerate and sounds wonderful. We had a portabello mushroom in a restaurant a little while ago that sounded similar. Surprised us that we loved it so much. This will be tonight’s dinner…if there is no snow storm to keep us in! Shawn, this sounds and looks wonderful! Can’t wait to try it. Thanks!! !